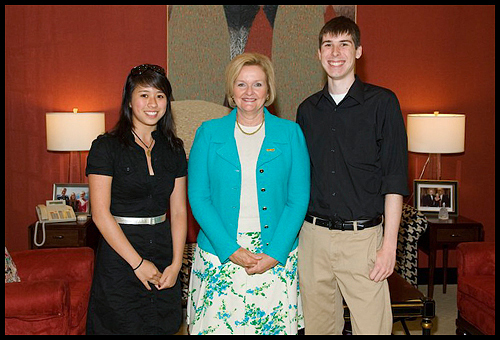 During coffee with Claire on June 25, Sen. McCaskill first welcomed everyone in the crowded conference room and then opened the floor for a few questions. A woman named Hope Tinker introduced herself and asked a question. Jeff and Mary Beth Tinker are basically best friends. 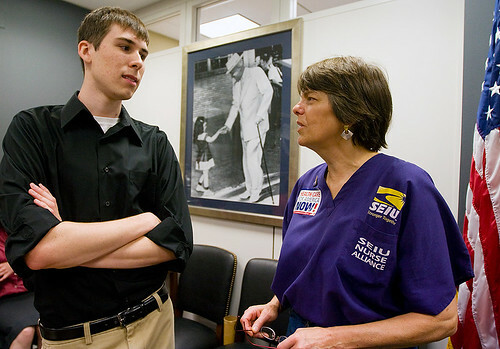 Jeff and Mary Beth Tinker, chattin' it up in Sen. McCaskill's office. Jeff usually looks this awkward in real life. That’s right, the Mary Beth Tinker of Tinker vs. Des Moines Independent Community School District. The Mary Beth Tinker who wore a black armband to school in protest of the Vietnam War, was suspended from school, sued the district in defense of her First Amendment rights and won the case in the U.S. Supreme Court. Today concludes the first week of my last year in college. I’m proud to report that I’ve been present and on time for all my classes, completed two photo shifts at The Missourian and begun research on the rural recession project. Because I don’t have a car (yet), all my assignments have been limited to wherever I can go on foot. I’m used to this — after all, how else did I manage while shooting as many as four assignments a day at The Maneater? Although I didn’t get to shoot the first day of school at various Columbia schools or Sen. Claire McCaskill’s health care town hall meeting in Jefferson City, I think I did all right for my first week on the job. On my first shift, I ran to the scene of some breaking news. We’d heard something about a fatality over the police scanner, but when the reporter and I arrived, we saw it was a minor accident involving a bicyclist and motorist. The cyclist suffered only scrapes and bruises, which he shrugged off before explaining that he’d been hit by a school bus in the previous year. That’s right. A school bus. Call me sick, but I wish I’d been there to see that. 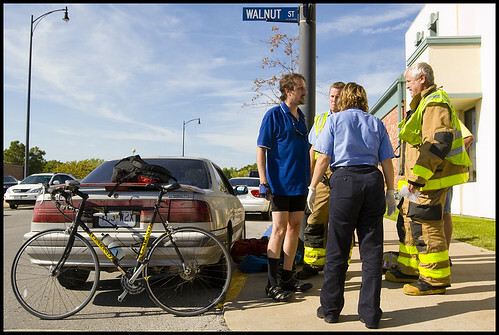 Cyclist Jeff Wainright talks with Columbia emergency responders after colliding with MU student and motorist Dan Marston on Tuesday afternoon in downtown Columbia. Wainright, who rolled over Marston's car hood, suffered only minor scrapes and bruises. The biggest lesson I learned? ENTERPRISE. Due to some communication mishaps, today’s paper didn’t have any A1 visuals lined up. So yesterday when I had a half-hour left in my shift, one of the editors told me to skedaddle and do some enterprising. So I did, even though I knew that walking around and searching for photo material might prove completely unprofitable and would only further inflame the chronic pain in my left foot. I got lucky with the first enterprise shoot I did. After I left the photo office, I headed downtown even though I knew there was very little if anything planned to be happening at that hour. But as I walked along Locust and crossed Ninth Street, I saw a trio of people carrying oddly-bundled instruments. I paused. Then I decided to go for it. They were the Hooten Hallers, a local blues/country band that I’ve heard before in Speakers Circle. In fact, they had just performed there and were on their way to The Blue Fugue, which is where I followed them. 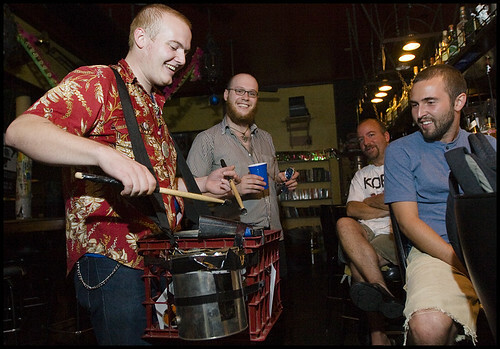 Hooten Hallers band member Andy Rehm plays a beat to the background music at The Blue Fugue on Thursday as fellow band member John Randall, Rocheport resident Richard Petty and Columbia resident John Thomas listen. After I left the Fugue, I went on-campus to cover the Legion of Black Collegians‘ opening barbecue. As a former Maneater staffer, I’ve photographed many of the major campus organizations, including LBC. That said, I was almost wholly unprepared for the high-energy dance party going on in the main room of the Gaines/Oldham Black Culture Center. Left to right, freshman Starsha Harris, senior Andrew Kelly, freshman Jacobi Ward and freshman Kielen Wilkins throw out some moves during the Legion of Black Collegians' barbecue Thursday evening at the Gaines/Oldham Black Culture Center. The annual barbecue, hosted by MU's black student government, featured food, dance and music. I returned to the photo office after taking a few more shots. I’d worked an hour overtime, was soaked to the skin (there was a gentle but steady rain after I left the Fugue) and felt relieved that my first stab at enterprising while on shift had been decent. That last photo was today’s key A1 visual. So yes. Enterprise is important. That’s what I learned this week. Classes and my senior year of college don’t begin until tomorrow morning, but I’m excited for this semester nonetheless. Today, I had two meetings that have determined how busy this semester will be — and it will be very busy. The first meeting was the staff photo meeting at The Columbia Missourian, a morning city newspaper affiliated with the MU School of Journalism and staffed completely (except for certain editorial positions) by students. I’ve been a reporter for The Missourian for a year, during which I reported on now-attorney general Chris Koster’s general election campaign, the state budget and other such state political and economic news. Now, I’m one of several staff photographers. I’m looking forward to this, mostly because I haven’t been on the field and behind a camera since freshman year, when I shot for The Maneater student newspaper. (In sophomore year, I was the Maneater photo editor, and last year I was doing political reporting for The Missourian.) I’ve talked to a few now-alumni who were also staff photographers at The Missourian. Among other things, they urged me to be enterprising and proactive in what I shoot. 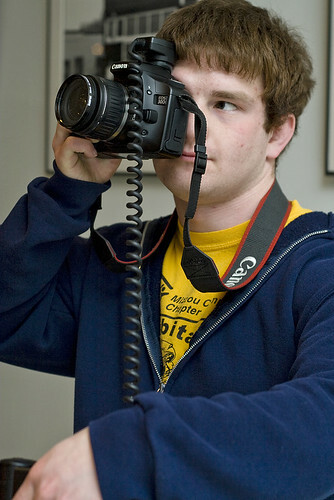 Which is exactly what the Missourian‘s new director of photography, Josh, said. During the staff meeting, Josh reiterated the importance of being proactive, even if it means getting just a standalone photo published. He repeated his desire/the need to make The Missourian more visual. Fortunately for me, I’ve already got a leg up on being proactive. Last semester, my Jefferson City editor Phill Brooks gave me a long-term article I never completed or even began: an in-depth look at rural poverty. Summer in the city: New York, here we come! ARLINGTON, Va. — Later this afternoon, Jeff and I are taking the bus up to New York City for a three-day weekend extravaganza in the Big Apple. As was the case with our spring break roadtrip with Esten, we have a lot we want to do and see, but only so much time for everything. As was not the case with our spring break roadtrip, we’ve meticulously planned out EVERYTHING that we’re doing in New York — even down to the subway/bus/walking routes we’re using to get to where we need to be. I haven’t been in New York since 2004, when my high school newspaper adviser took six of us young eager journalists there for the Columbia Scholastic Press Association‘s Gold Circle Awards. We spent spring break there and, as well as I can remember, stayed in Manhattan. Before that, my mother has taken me to New York twice — once when I was probably four or five, and then again in 2001, three months before two planes flew into the World Trade Center and made their indelible mark on history and foreign policy. Each of those trips lasted at least a week. Now, Jeff and I have three days to explore Central Park, wander Lower Manhattan and the financial district, walk the Brooklyn Bridge, take the Staten Island Ferry, visit the United Nations complex, walk along 42nd Street, take evening photos from the Top of the Rock, stroll around High Line Park, people-watch in Times Square, eat at Katz’s Deli (what did Sally order, anyway? ), tour the Eldridge Street Synagogue and take a gander around Chinatown. Ambitious? Probably a bit much. But we’ll make it work, and we’ll have the photos to prove it. Leave it to me to find a rodeo in Maryland. Sunset at the J Bar W Ranch. I was born and raised in Texas, where every child grows up knowing how to square-dance, wearing cowboy/-girl boots and learning about the great massacre battle at the Alamo. For the vast majority of my 20-something years on this earth, I’ve denied the now-very-evident presence of Texas blood in my veins. My favorite joke was (and still is, actually), “What happens when you split Alaska in half? [Pause] Texas becomes the third-biggest state!” I rarely eat beef, a meat not unique to Texas but certainly an integral component of Texan history and pride. But ever since I moved to the East coast for the summer, I’ve realized more and more just how Southwestern/Texan I am. For example: I want cowgirl boots. I like country music. 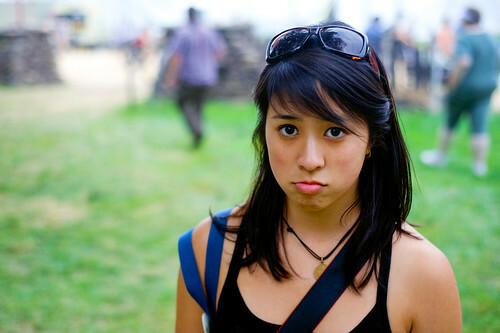 Talking to some people inexplicably draws a Southern accent from my lips that I previously didn’t know was in existence. When cars on the Beltway are closer together than two car-lengths, all I can do is grit my teeth, ask, “Why are there OTHER CARS on the road?” and yearn for long stretches of straight, empty highway. And then I started hankering for a rodeo. 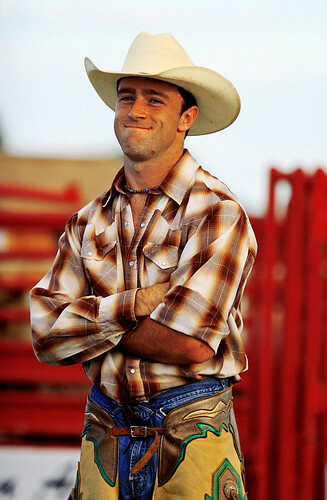 The No.-1 ranking cowboy at the start of the rodeo. 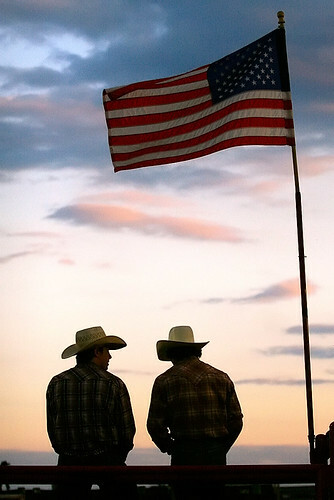 I love cowboys. That's a general statement.